Spider veins also known as “telangiectasia” are the manifestation of venous insufficiency, which is very much similar to varicose veins but smaller. They are generally blue, red or purple in color, which are easily visible on the face, thighs and lower legs and they appear to look like fine lines, web-like maze or clusters. Spider veins sometimes occur on the large areas of skin, which is usually due to cosmetic problems. Incidence of spider vein is more available in women, but men too are affected with this problem usually they are concealed by hair growth on the leg. There are number of factors that contributes to development of spider veins such as hormonal shifts, smoking, pregnancy, broken capillaries, consumption of alcohol, occupation, hereditary, weight gain, birth control pills, poor blood circulation and prolonged sitting or standing. Today, there are many effective and painless methods, which help to eliminate spider veins. 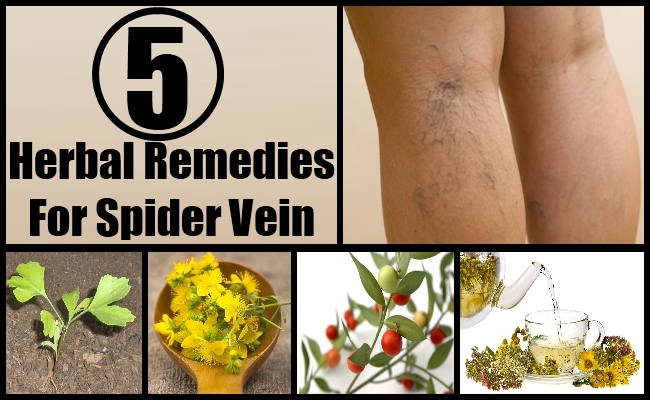 Below given are few herbs that eradicates spider vein. Gingko is a powerful herb that is high in glycosides and bioflavonoids and thus helps to strengthen the tissues that make up your vein walls and is referred as ‘magical herb’ due to it’s healing properties. Gingko supplies sufficient circulation to legs, thereby preventing from nerve damage. 40 grams of gingko is advisable three times a day for spider veins. St john’s wort also known as Tipton’s weed is a perennial herb containing all essential nutrients, compounds and anti-inflammatory properties that helps to reduce inflammation for both internal and external ailments. The flowering plant of St john’s wort is used to prepare tablets containing concentrated extracts. You can consume as infusion that will help to nourish the veins or simply use it externally in oil or tincture form, rubbing them to the affected area. Horse chaste-nut seeds have been used in herbal preparations that helps to reduce the swollen veins , elasticity of vein walls and improves your leg tone. It contains a compound called ‘Aescin’ that appears to ‘patch up’ the tiny capillaries, thereby improving the elasticity and strength. Mix half teaspoon of horse chaste-nut powder in 1 cup of water, dab a soft cloth in this solution and gently rub over the affected area of veins. Herbal tea works wonder for all health conditions, especially where veins are concerned. It is a simple procedure, which is effective and inexpensive. Mix one ounce of hawthorn leaves, hibiscus flowers, blackberry leaves, calendula flowers and raspberry leaves. Blend all these herbs well and pour 1 tablespoon of this blend over boiling water. Steep for 15 minutes and drink as and when you feel like. These herbs contain flavonoids and red pigments, which improves your vein and repairs damaged vein walls. Butcher’s broom is a herb that helps to treat spider veins. It is advisable to take butcher’s broom in form of capsule to cure and prevent spider veins. This herb increases circulation to lower extremities and treats venous insufficiency. Recommended dosage of this herb is 100 gram. Avoid butcher’s broom if you have high blood pressure. Apart from above herbal remedies, there are many things you need to follow to prevent from spider veins like exercising regularly, avoid crossing legs when you are sitting, stock up on stockings, cut down on intake of alcohol, invert your legs with yoga, avoid wearing high heels and when possible elevate your legs.